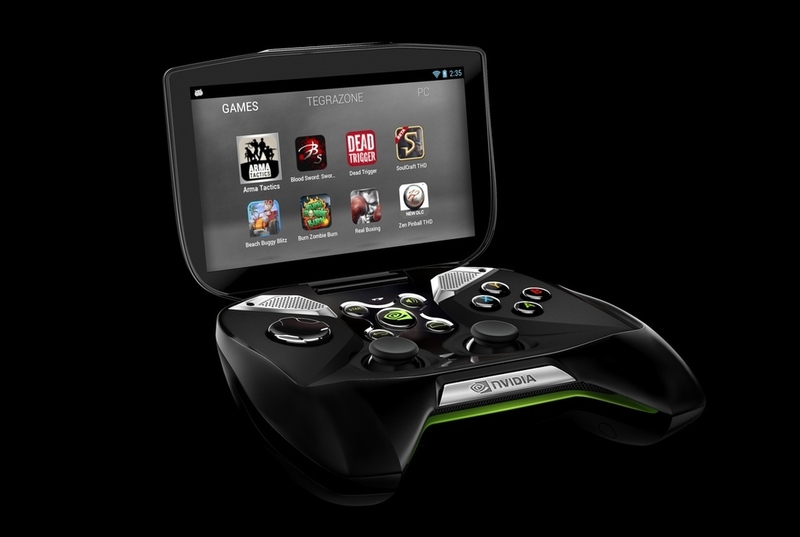 NVIDIA's Project Shield gets renamed as the NVIDIA Shield: Arriving in June for $350! We already know most of the juicy details about NVIDIA's Project Shield, we covered the news way back when it first broke. Today though, things have all become a little more real as the Shield has been confirmed to debut this June for the princely sum of $350! Just as before the internals are powerful: there's a Tegra 4 processor backed up by 2GB of RAM, a 5-inch "retinal" (yeah we know) 1280 x 720p IPS display and on the storage front there's 16GB of internal storage which is expandable with MicroSD cards up to 64GB in size. NVIDIA are still trying to sell this thing as a second console-quality controller which makes the most of its 720p screen for on the go gaming and that PC streaming which we heard about before! We now know a couple of the titles which will come to the platform and they include Double Fine's 'Broken Age' and 'Costume Quest' and there's now also going to be a new version of 'Chuck's Challenge' on the way from Chip's Challenge. Simultaneously the folks from AR.Drone are adding support for their toys to the Shield and that will bring controller-based inputs to their platform. On NVIDIA's part they've promised that there will be monthly OTA's for their system to ensure that everything is working well and that you'll be on a good version of Android. There will also be a bump to Android 4.2.2 after you've booted the system up, as it ships from the factory with 4.2.1 installed. One thing NVIDIA have warned us about is that not all apps work right away, especially not if they don't offer a landscape mode. You'll find that Netflix will have this issue if you use that for example. If you want one of these devices and you simply can't wait then you can pre-order one now direct from NVIDIA now if you're on their mailing list or if you add yourself to it, if not then put May the 20th in your calender!